A self-built damper dyno with enough capability to show some puzzling damper behaviour. Beninca Motors in Melbourne recently completed another item of in-house developed and constructed automotive equipment. Having previously designed and built a digital tailshaft balancing machine (and a small electric motor dyno is currently being completed), the thought of developing a damper dyno didn't faze the boys at all. The necessity for the damper dyno came about through the company's involvement with the G-Force active suspension system (being developed with The Auto Edge and covered in AutoSpeed at "Active Suspension For The Masses"). In order that hydraulic forces could be best assessed in the active suspension system components, an accurate and controllable test system was needed. 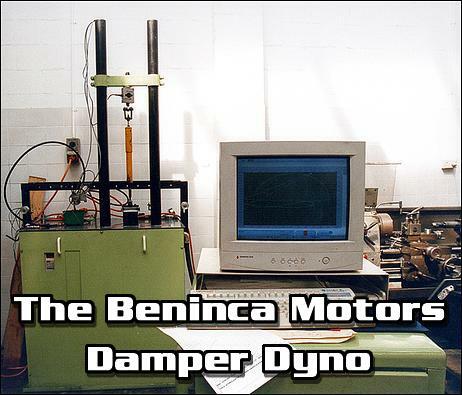 Enter the Beninca damper dyno, which is also quite capable of being used with conventional suspension system dampers. The damper dyno stands tall and proud. Its size was related to the fact that the mechanicals inside the lower box need to be long if design limitations are to be minimised - and of course the damper has to be working vertically during its testing. The orange/yellow Koni damper that can be seen mounted on the machine is of a normal automotive size. With the lower cover removed, the guts of the machine are revealed. Joe Beninca - the machine's designer and constructor - made the point to us that if he were to build another, he would probably do things a little differently. Indicative of this are some extra pieces of steel welded into the lower structure - the forces developed when stiff dampers are tested at high speeds is quite amazing. The mechanicals comprise an electric motor that turns through a right-angle reduction drive. This spins a disc to which a con-rod is attached eccentrically. The con-rod connects to a shaft supported by two linear bearings, the approach turning the motor's rotating movement into a reciprocating one... a little like a conventional piston engine working backwards. The electric motor that is used is a 3-phase, 10hp unit. The reduction right-angle drive (equipped with a 65mm shaft diameter for stiffness) uses a 5.2:1 ratio, while the conrod can be bolted to the spinning plate at many different positions, allowing the stroke to be altered from 10mm - 150mm. The con-rod lower and upper bearings each comprise two tapered roller bearings usually used in automotive wheel bearing applications. Relatively small linear bearings with a double shaft were used on the slide mechanism above the upper con-rod bearing to avoid a situation where the accelerations were so high that the ball bearings did not turn, but rather skidded. The electric motor speed control is an off-the-shelf unit that has internal protection capabilities and digital speed selection. Normally revealed is just this part of the machine. Two hefty tubes (each has a 5mm wall thickness!) project above the table surface and support a crosspiece. This is adjustable for height, allowing a variety of different damper lengths to be catered for. Suspended below the crosspiece is a 5-tonnne electronic load cell, with the shaft of the damper being connected to it by means of a rose joint. (Steel flex joints are also sometimes used to provide no-slack joints.) In addition to damper load, other parameters measured include temperature and pressure, with the latter using a 0-205 Bar transducer. The rotational position of the gearbox shaft is monitored by a 500-line encoder, which allows the very accurate collection of data, especially as the damper is passing through bottom and top dead centres (ie at the change of direction from bump to rebound and rebound to bump). A Top Dead Centre reference pulse is also outputted so that the data acquisition system knows where the damper is in its stroke. Damper stroke is automatically selected in the program by the simple expedient of having a metal vane break beams of light between a row of LEDs and their accompanying sensors. This allows stroke to be "autoselected" by the software at 10, 15, 20, 25, 30, 40, 50, 60, 75, 100 and 150mm lengths. A 16-bit, 200kHz data acquisition card is used to log data to a PC. In fact, the card (and its accompanying expansion board) are more sophisticated than needed in this application, but the Benincas use the PC with a number of their workshop machines - and some of the functions are required in other applications. The load cell uses a high-gain (1000 times) strain gauge amplifier, while the digital encoder data is fed straight into the encoder interface on the card. Optical isolation is now used on all digital and encoder inputs, as without it at times external interference caused random additions to the count, making the system 'lose its place'. National Instruments LabView 5.1 is used as the building block of the damper dyno software developed by Joe Beninca. Drawn on the PC screen are two series of graphs. The first - shown here in green and in the following printed graphs in red - is the damper load extension (in kg) versus the damper stroke (in mm). Importantly to understand this graph, the zero point (for both load and stroke) is in the middle of the screen. Also shown (in blue on this screen and in green on the following printed graphs) is damper velocity versus load. Not shown on these graphs are measurements of pressure, which can be graphed against stroke. This data was generated from the damper that can be seen mounted on the machine in the above pictures. It can be very hard to picture all that is happening, but we'll have a go. It is important to realise that the velocity of the damper varies with the position of the damper shaft. As the damper reaches both top dead centre and bottom dead centre it slows, while its speed is fastest at the mid-point of the stroke. Looking at this damper velocity graph, it can be seen that when the damper is at bottom dead centre (BDC) its velocity (measured on the bottom axis) is zero. This makes sense - the damper must stop during its change of direction! The damper then gets faster and faster as the stroke nears its halfway point through its extension, before it again slows as it reaches TDC. The maximum speed it reaches with the machine set in this configuration is 0.213 metres/second, and while when the shaft is stationary there is no force being developed on it. But here's where it gets very tricky. As the damper starts to near full compression its speed slows - that's fine. But the load acting on it doesn't return to zero - there must be residual pressure within the damper that is still having an impact. Even with the compression speed at zero, there is a 38kg compression load acting on it - substantial when the maximum load compression that is reached is about 78kg. The asymmetry on the load versus velocity graph is apparent for all dampers, but varies in its magnitude between them - and is also dependent on the damper shaft speed. (ie It is not an artefact of the machine.) A Commodore damper has a very pronounced asymmetry in its velocity versus force curve, while a tested late model Alfa damper was nearly symmetrical. How this might affect on-road behaviour is unknown. This graph is the better known one derived from a damper dyno. It shows load extension (measured in kg on the vertical axis) versus damper stroke (measured in mm on the bottom axis). Looking at the left and right of the graph it can be seen that the displacement in each direction (ie bump compression and extension) is equal at 10mm, while a maximum load occurs on the extension (ie rebound) side of the graph of about 145kg. On the compression (ie bump) side the damper develops a maximum load of about 75kg. Note again the asymmetry of the damper's performance. But what does all of this mean when you're making changes to adjustable shocks? The following series of graphs shows the measurements gained on some adjustable Koni dampers, where bump (compression) and extension (rebound) could be varied separately. Start winding in the adjustments (specifically rebound position #2 and bump position #6) and the damper's performance immediately changes. Now rebound has a maximum load of nearly 250kg and bump has risen substantially to 70kg. Maximum damper velocity remains at 0.392 metres/second - the damper dyno is doing its work correctly with the damper speed not being altered by the greater loads being placed on it. Note also how the residual pressures have started to alter the velocity versus load curves. With bump and rebound set to their max positions, rebound has risen to 355kg and bump is on about 160kg. That's a measured adjustable difference in damping load of 58 per cent for rebound and 540 per cent for bump! Note that at maximum damping, the shaft speed had dropped to 0.390 metres/second - a change in peak velocity from lightest load to heaviest load of only 0.5 per cent. This shows that even a 10hp motor can still be slowed - and says a lot about using a shocker dyno with less power. In a way the Beninca damper dyno test data generates more questions than answers - a common occurrence with quality measuring equipment! Relating the results gained on a damper dyno to on-car performance variations is also another specialised field, one where years of experience will be of paramount performance. However, even at its simplest, the damper dyno can be used to set up pairs of dampers identically, to endurance test dampers (even after a few minutes of high speed cycling, the old guinea pic Koni damper was too hot to touch and its damping characteristics started to alter! ), to quickly assess damper health, and as a development tool. And the damper dyno itself? In addition to showing the very high order capabilities of the Beninca workshop, it puts damper testing within the reach of many who would previously avoided what is normally such an expensive process. If you'd like to get a set of four dampers tested on the dyno it will typically set you back only about $66 (inclusive of GST). To generate a whole family of curves for adjustable dampers the cost is about $132, again for four dampers! That cost is low enough that even if you just want to make sure that a pair of dampers is working properly, it's worthwhile. And you'd like Benincas to build you a damper dyno? Well, they won't do that, but they're happy to supply the electronics and software - together with details on how to build the mechanicals.